For there lay The Combs - the set of combs, side and back, that Della had worshipped for long in a Broadway window. 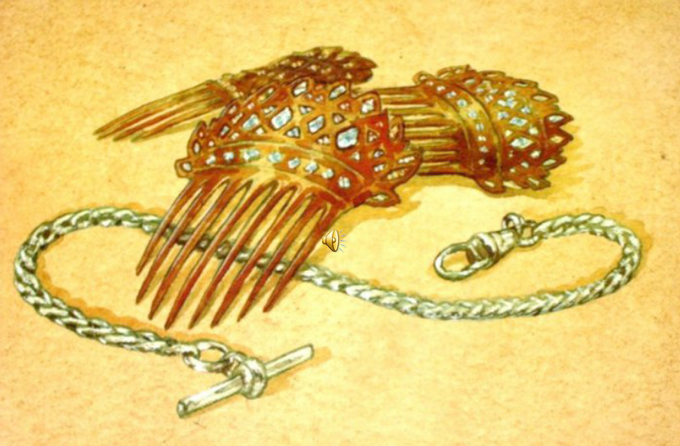 Beautiful combs, pure tortoise-shell, with jewelled rims - just the shade to wear in the beautiful vanished hair. They were expensive combs, she knew, and her heart had simply craved and yearned over them without the least hope of possession. And now, they were hers, but the tresses that should have adorned the coveted adornments were gone. Ибо на столе лежали гребни, тот самый набор гребней - один задний и два боковых, - которым Делла давно уже благоговейно любовалась в одной витрине Бродвея. Чудесные гребни, настоящие черепаховые, с вделанными в края блестящими камешками, и как раз под цвет ее каштановых волос. Они стоили дорого... Делла знала это, - и сердце ее долго изнывало и томилось от несбыточного желания обладать ими. И вот теперь они принадлежали ей, но нет уже прекрасных кос, которые украсил бы их вожделенный блеск. Тут она вдруг подскочила, как ошпаренный котенок, и воскликнула: - Ах, боже мой! - Делл, - сказал он, - придется нам пока спрятать наши подарки, пусть полежат немножко. Они для нас сейчас слишком хороши. Часы я продал, чтобы купить тебе гребни. А теперь, пожалуй, самое время жарить котлеты. The magi, as you know, were wise men - wonderfully wise men - who brought gifts to the Babe in the manger. They invented the art of giving Christmas presents. Being wise, their gifts were no doubt wise ones, possibly bearing the privilege of exchange in case of duplication. Волхвы, те, что принесли дары младенцу в яслях, были, как известно, мудрые, удивительно мудрые люди. Они то и завели моду делать рождественские подарки. И так как они были мудры, то и дары их были мудры, может быть, даже с оговоренным правом обмена в случае непригодности. And here I have lamely related to you the uneventful chronicle of two foolish children in a flat who most unwisely sacrificed for each other the greatest treasures of their house. But in a last word to the wise of these days let it be said that of all who give gifts these two were the wisest. Of all who give and receive gifts, such as they are wisest. Everywhere they are wisest. They are the magi. А я тут рассказал вам ничем не примечательную историю про двух глупых детей из восьмидолларовой квартирки, которые самым немудрым образом пожертвовали друг для друга своими величайшими сокровищами. Но да будет сказано в назидание мудрецам наших дней, что из всех дарителей эти двое были мудрейшими. Из всех, кто подносит и принимает дары, истинно мудры лишь подобные им. Везде и всюду. Они и есть волхвы. Jim and Della were two young people, husband and wife. They loved each other dearly. They lived in a small room in an old house in one of the the dirty streets of New York. They worked from early morning till late at night, but they got little money for their work. And still they had two things which very dear to them — Jim's watch and Della's beautiful hair. Christmas was coming and Della wanted to give Jim a nice gift, but she had no money. She really did not know what to do. She sat on the sofa and began to cry. Suddenly an idea came to her. She got up and stood in front of the mirror and looked at her beautiful long hair. Then she left the house and in a few minutes she was already at the hairdresser's shop. "Will you buy my hair?" she asked. The hairdresser looked at her hair and said, "Yes, I will. It's fine hair. I can give you twenty dollars for it." Della was very happy. She took the money and went to buy a present for her husband. In one of the shops she saw a very beautiful watch-chain. "I'll buy it, Jim will be very glad," she said to herself. "He needs a chain for his watch." So Della bought a gold watch-chain as a Christmas present for Jim. When she got home, Jim was already there waiting for her. He looked at his smiling little wife and understood everything. "Why did you do it?" he asked. "Dear Jim, my hair will grow and I wanted to give you a present – here it is," and she put the watch chain into his hand. The beautiful chain, Della's present, was of no use to him. He had sold his gold watch to buy a Christmas present for his wife. He took a packet out of his pocket and gave it to Della. She opened it and saw two beautiful combs, the combs that she had seen in a shop window and had wanted for so long. 2. Ответьте на вопросы по тексту. 1. Who were Jim and Della? 2. Where did Jim and Della live? 3. How many dollars did Della get for her hair? 4. What did Della buy for her husband? 5. The chain was beautiful, wasn't it? 6. Did Jim sell his gold watch to buy a Christmas present for his wife? 7. Was Della happy or unhappy with her husband's present?